How do you disrupt and build great innovative solutions in your company and your teams, whether you are a five-person startup or if you are a 100,000-person firm? The answer has been made very clear by the research and the now long list of innovative companies that we look at and can study. Salim Ismail is a researcher, author, and someone whose business and publications seek to really helps businesses hit the next level. I had the privilege of hearing about his work recently and loved seeing the rigor on his analysis for something, that once brought to light, feels very practical and within reach for any product team. In fact, upon him highlighting this method, it was easy for me to see successful case studies all around from my own history. What his work has shown and reflects, when you look at the businesses that are innovating, is that if you want to innovate, you have to take the kernel of the idea and the resources and put it on the edge of the organization. Get it away from politics, the common life of a team member within your company. So, if you are in a large company and “always do stand-ups”, or “have check-ins” and “we always do this here because we are a big organization” – you need to get rid of it for this core innovative group. It doesn’t mean that they go rogue. It simply means that they need to be put on the edge of the organization, away from all of the noise, and the assumptions and the blockers that can come both to the business and to the thinkers that are trying to expand. We want our teams to think beyond the current bounds. That’s why we created these innovative teams. As in anything, we give them budget, we give them a target, we give them direction. But, if you want to be innovative and you want your business, your team, your charity, to create something new that can have a difference, do what the leaders are doing. Apple … pick any business, right? Apple’s the most obvious today. They’re very classic about moving their different dev and special projects teams out to the edge where it’s very secretive, even inside the organization. In fact, the last group to move to Apple’s newest headquarters was their secretive product development group – on the edge, forever. To see success – focus on creating these open development spaces. So, it’s a charity. You’re trying to raise money. You’re trying to create the next iPhone, the next watch. You’re trying to build hospitals in Rwanda. You’re trying to create a new health and wellness program. Whatever it is, find those people, protect those people, put them in a place. Definitely, obviously, we’re going to reintegrate long-term, but you want to innovate. You have to establish it in that manner. 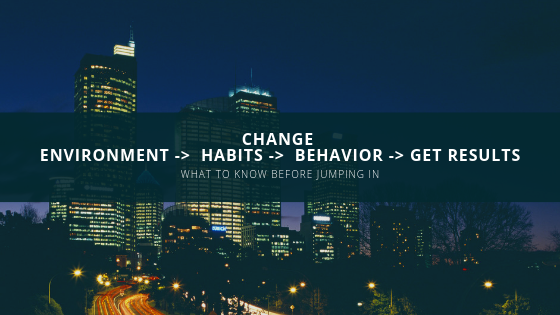 You must change the habits to create new behaviors, new methods, new markets, and new solutions. So, let’s go build something to change the world. Previous post: Stop playing in the middle – the edges are where you win! !